Author & Founder of Fierce, Inc.
Pope Francis embodies a key trait of a great leader -- the capacity to connect with others -- at a deep level. For many, Pope Francis is a welcome change, a breath of fresh air, someone we'd like to invite to dinner and a conversation. He is influential, in part, because the emotional wake during and following his comments is an afterglow, not an aftermath, an aftertaste. Last week, Pope Francis had a conversation with the head of the Russian Orthodox Church, ending a nearly 1,000-year schism because of deep differences. Following the conversation, Pope Francis said, "We are not competitors, but brothers." 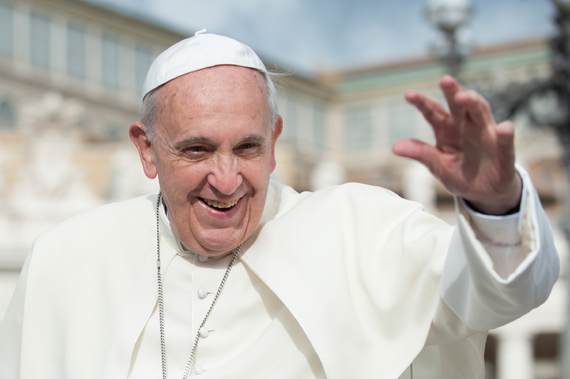 Pope Francis serves as a positive role model for the young people who will soon be running our world. Consider these evocative and appropriate lyrics from the Sondheim musical Into the Woods. We are always modeling something for our children. The question is -- what are we modeling and how can we select leaders that will illustrate the values we wish to perpetuate? Our current front runners are modeling an us vs. them mind set, which if any are elected, will ensure that there will be no change within a "do nothing" Congress with the worst track record in history. Trump has stated publicly that he wants to beat China -- and anyone or anything else that offends him. Isolating America from the rest of the world is not only naïve, it is irresponsible and will only upset and confuse the countries that have stood by us. If Trump is elected and attempts to issue directives, Congress will stuff him in a locker and throw away the key. Sanders displays an "us vs them" desire to rise against the one percent of the country, and while seemingly noble, this employs the same divisive strategy as Trump. Decreasing the gap and providing more opportunities for those less fortunate is admirable, but not in the path he has taken. Business owners provide jobs on which many families depend for their well-being. Targeting the wealthy as enemies will create a standstill and break down communications. The polarized parties in the United States are in no danger of agreeing on one man or woman to step into the White House but the fact is, we are not "united." We are divided and we all know the saying divided we fall. The problem is that the debates are deepening the divide, amplifying the lowest part of who we are. Anger, fear, an illusion of superiority, a need to put others down. We are a global economy, a global market place, relying on each other for survival. While we have a right to strongly held beliefs, our subjective truths are preventing intelligent dialogue. Multiple, competing realities must be considered and valued. We need a president with the charisma and strategy to unite all citizens, not support a hate-filled revolution. Until we master the courage and the skills needed to engage in conversations that help accomplish the goals of our shared civilization, devising a plan that transcends individual gain and personal ambition, we will move away from greatness, not towards it. I believe that, while no single conversation is guaranteed to change the trajectory of our shared planet, any single conversation can. For a leader, there is no trivial comment. Every word out of a presidential candidate's mouth either enriches relationships, flatlines them or extinguishes them. The conversation is the relationship. I wonder if there is, unrecognized, a Pope Francis in our midst, and how we might identify him or her. Echoing American mythologist, writer and lecturer, Joseph Campbell, the President we choose is the President we deserve. Shame on us if we get it wrong. Shame on us.